And if that doesn’t at least pique your interest the tiniest bit, fear not: the film lives up to its fantastic and absolutely absurd premise. The film follows the romantic journey of an older woman who belongs to an all-women’s club whose motto rejects the notion of love for an ethos of sisterhood. Its sole purpose is to compete to bring in the most attractive man to their weekly meeting before murdering and making hot dogs of the recently deceased bachelors. And while the word “absurd” comes to mind immediately after reading any summary of the film, so does the word “clever”. The men are made into hot dogs sold at an amusement park as a less than subtle reversal of power norms. The dialogue throughout the film is engaging, realistic, and tongue in cheek all at once, somehow creating believability within a dystopian romantic fantasy. The film was set in a dark, secluded community where the club had infiltrated the police force and killed hundreds of men without being noticed, highlighting the beauty of the lead more and more as she began to believe in love. And at many points, I just had to laugh - I was delighted not only that this movie exists, but that it was both reminiscent of a Handmaid’s Tale and romantic comedies at the same time, often in the same scene. The director, who made an appearance at the US Premiere at Fantastic Fest, remarked that his motivation for making the film was that “men are very boring - I wanted to make a film about women, they’re much more interesting. Who runs the world?” Indeed, the world he created may not be a utopia, but the women who run it make for an incredibly interesting film that is begging for a watch. First, a disclosure - I had never seen an Asian film before, outside of a couple outstanding Miyazaki productions (Spirited Away, Howl’s Moving Castle). I imagine most American moviegoers might say the same - unless they’ve seen Crouching Tiger, Hidden Dragon or other non-Western kung fu films. And after seeing Shadow, from acclaimed contemporary director Zhang Yimou, I am even more confident that I, like so many, have been missing out. Fix the problem: go see this film. The first few moments of the film asserts that the videography will be beyond beautiful, and the movie holds serve throughout. One of my favorite images in film this year, alluded to in the trailer, features a bloodied warrior behind a translucent wall-to-floor painting staring towards the camera: the audience is only separated by the thinnest of, well, film. The story, set during the period of the Three Kingdoms (220-280 A.D.), shifts between the point of view of a king, his sister, his commander, the commander’s wife, and the eponymous Shadow, the commander’s secret look-a-like being used to accomplish a political scheme. While the scheme itself perhaps falls short of Game of Thrones’ complexities and constant surprises, the stories of the five main characters are compelling. Zhang himself called the story one of “struggle, survival, dire predicaments and wild ambition”, set against the power games of kings and nobles. And while the story of the wife and the king’s sister feel somewhat limited in their arcs, the odyssey of the Shadow makes the story more than engaging. More importantly, every scene - especially the fight scenes set in flowing rain, contrasting with stark, red blood - sets a brisk pace and feels distinctly Chinese, much like the aforementioned ink paintings. Shadow may very well be the most beautiful film of the year, and the storytelling is almost as engaging. If you’re in the mood for high-powered action, stellar videography, or just an appropriate induction into the genre, please treat yourself to a showing. When you think of Nicole Kidman, do you think of her transcendent musical performance in Moulin Rouge, or maybe her heartbreaking portrayal of an victim of abuse in Big Little Lies? More to the point - if you didn’t already realize that she is one of the most talented and versatile actors of our generation, you need only see one of those two works and Destroyer. In this story of vengeful LAPD detective Erin Bell, Kidman-as-Bell kills (literally and figuratively), stealing the show and making an admittedly decent story more than watchable. The movie chronicles Bell’s quest for revenge against a crew of bank-robbers that she infiltrated 18 years prior, using copious flashbacks to contrast her rebellious youth against her obsessive, regretful, and pained current existence. The supporting cast is quite star-studded, with Sebastian Stan playing a romantic interest and a strong performance from Toby Kebbell as the deranged antagonist, but they all seem to fade against Kidman’s tour de force. While the film’s dialogue on its own didn’t blow me away, every one of Bell’s withering looks, drunk punches, and errant fired bullet is filled with fury. If you’re looking for the female version of John Wick, but with a gritty detective story in place of over-the-top action, look no further, sit back, and enjoy. A movie with Craig Robinson and Aubrey Plaza I’m thinking this is going to be hilarious. Sadly, I was mistaken. The film is supposed to be a comedy but aside from a few laughs here and there I was not amused. The film starts off in a diner where Lulu (Aubrey Plaza) works at, that is until she is fired by her boss Shane (Emilie Hirsch) who happens to be her husband as well. Things start to happen and the film goes nowhere. Side note I have no idea why the people in this film drink so much coffee or the importance of it. The concierge guy was the source of much of the humor for me. Lulu brother’s is a character I could have done without. I think the grunting from Beverly Luff Linn (Craig Robinson) was funny the first two times then quickly became annoying. This is definitely not a film I would recommend watching. This is my favorite documentary I’ve seen so far. The film had so many funny moments and the times it took a serious tone I nearly cried. I Used to be Normal delves into the lives of four fangirls and how they have each been impacted by boy bands, specifically One Direction, Take That, Backstreet Boys, and The Beatles. It was filmed over the course of four years and takes a look at three generations of women. At first, I thought the film would be super cheesy and boring, but I was wiling to give it a shot and I’m super happy that I did. These women have close connections to the boy bands music because it brings them joy and reminds them of important moments in their lives. For me the star of this documentary is Elif. She and her parents immigrated from Turkey when she was very young and have had hard times here in America. Elif’s parents didn’t understand her love for One Direction or her passion for singing. The documentary showed me that these women are so much more than just crazed fangirls. I left the theater feeling so grateful that I watched it. Everything weird seems to happen in Alaska. They have alien abductions, vampires, and now kids are being taken by wolves. Medora (Riley Keough) writes to Russell Core (Jeffery Wright), a wolf expert, asking him to help her find her son who has been taken by wolves. The film’s cinematography and Jeffery Wright’s performance both come together to create suspense and drama. I definitely was not sure how the film would end. When it did however it left me a bit unsatisfied, because I had more questions than answers. I was left wondering about the symbolism of the wolves and the meaning of the story as a whole. Honestly, I just wish the screenwriter would have developed the plot more. While it’s not the best film of the year, I'm glad I watched it. 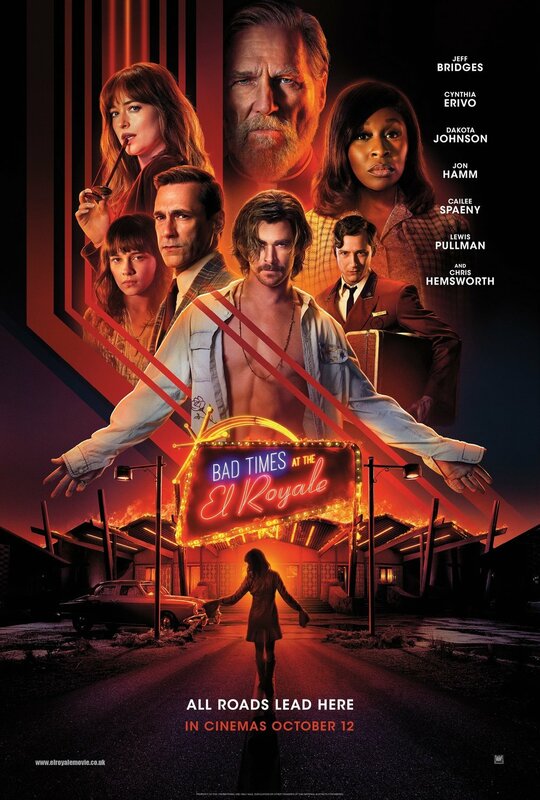 A priest, a singer, a vacuum cleaner salesman, and a hippie all check in at the El Royale, a novelty hotel that has one half of it in California and the other in Nevada. No, this is not the start of a joke but rather the set up for a very eventful evening because there’s more to this hotel than meets the eye. However, once the secrets are revealed the film starts to fall flat for me. John Hamm and Cynthia Erivo were both great to watch and Jeff Bridges, as always, gives a convincing performance. Dakota Johnson isn’t quite as good but I think it has more to do with her character not being that interesting than her acting but I could be wrong. Newcomer Cailee Spaeny is a pleasure to watch along with Lewis Pullman. The film fell short of my expectations, which were very high for this star studded cast, simply because of the direction it took towards the end. I think the film should’ve told us who Miles’ bosses are and why are they running this hotel in addition to revealing a little bit more about John Hamm’s character. Towards the end I found myself waiting for something else exciting to happen, but it never did. Overall, it was an enjoyable film I just found myself wanting a bit more.